Decades before Marlene Dietrich donned her infamous top hat and tails, Aubrey Beardsley ruffled polite society’s feathers by putting a peacock tail on a woman. His illustrations for Oscar Wilde’s 1894 play Salome showed Herod’s stepdaughter posing transgressively in a skirt that mimicked the plumage of a frisky male bird. In one, she leans over a co-con-spirator in an almost vampiric pose, eyes flashing, brows arched defiantly. The image was a million miles away from the Victorian ideal of the swooning lady, and its creator found drawing-room doors being slammed in his face all over London. Had Beardsley fitted Salome out in duck down or pheasant feathers, nobody would have batted an eyelid. Not for nothing is one of the collective nouns for the peacock ‘an ostentation’ -no other bird is so saucy, so totally convinced of its rightness in all res-pects, and outrageously testy to boot. Residents of Breadsall in Derby-shire recently found themselves held under virtual house arrest by one named Kevin, and when the Fife town of Dunfermline’s birds approach the main road, the traffic grinds to a nervous halt. Robin Day apparently once had to pause an interview with Harold Macmillan three times due to a peacock shrieking. Gardeners, surveying desecrated flowerbeds, shake their fists at bejewelled interlopers, and light sleepers curse them in the small hours of the morning. And yet, in spite of its histrionic tendencies, this extraordinary bird is as much a part of the country-house tableau as fountains and parterres. 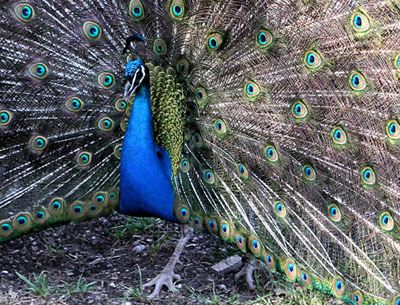 Taken from its homeland by traders thousands of years ago, the Indian peacock (its African cousin resembles a turkey on its way to a fancy-dress party) eventually reached England, where it became something of a courtly commonplace. Medieval knights took a ‘vow of the peacock’, ornamenting their armoured helmets with the bird’s distinctive feathers, and the Elizabethans named the pavane, a stately dance during which ladies’ gowns trailed along the floor behind them like peacocks’ tails, after the Spanish word for the bird. Hundreds of years later, this in turn lent its moniker to an iris cultivar with intricately patterned petals that fan outwards. The birds would even have been familiar to a glover’s son from Stratford-upon-Avon-Shakespeare has muscle-bound Ajax strutting around the battlefield ‘like a peacock’ in Troilus and Cressida, and conjures up this most bombastic of fowl as a warning in The Comedy of Errors. However, the peacock’s heyday was the late 18th and early 19th centuries, at a time when the East India Company was filling the popular imagination with thoughts of hill forts and emeralds. In 1876, shipping magnate Frederick Leyland tasked James McNeill Whistler with finishing off the dining room at his London home. Whistler, whose head had been turned by the peacocks that his friend Dante Gabriel Rossetti kept, went overboard on the golds and blues, to his patron’s horror.Sezincote, Gloucestershire’s very own Taj Mahal (thought to have been at the forefront of the Prince Regent’s mind when he remodelled Brighton Pavilion) features a conservatory decorated with peacock-train arches that was once home to an exotic menagerie. The metallic arcs of peacocks’ tails, lavishly inlaid with eye-spots, are more decadent than anything Klimt or Kandinsky could have dreamed up in even their trippiest moods. There’s evolutionary method in the madness-scientists have recently discovered that peahens have incredibly short attention spans, so pros-pective mates must be impossible to ignore. The birds are living artworks, and they’ve been enlivening curtains, cushions and tapestries for decades. Leading the furnishing-fabrics charge was William Morris, whose Peacock and Dragon fabric, designed in 1878, wouldn’t look out of place on a magic carpet. The peacock was also taken up by his sworn enemies, the ‘art for art’s sake’ Aesthetic brigade. The group, which counted Beardsley among its number, was inspired by Ruskin’s dictum that ‘the most beautiful things in the world are the most useless: peacocks and lilies for instance’. Country Life itself. The issue you’re reading is home to something approaching two dozen of the birds-the end-stops that mark the conclusion of each feature are all shaped like peacocks. It seems entirely appropriate that a magazine compared by Roy Strong to parkland in his book The English Arcadia-he describes it as one ‘in which to go for a walk’-should be ornamented thus.